Comparing two of the best web hosts is undoubtedly tricky! SiteGround and BlueHost are both great hosts. To give you the best overview, I signed up to both web hosts at the same time to host 2 identical sites. Why did I do this? Simple, I’m a customer, and so are you, so why not! I hope that my comparison will give you an all-round hosting comparison of these two popular hosts. I might think they are both great, but this comparison will present the truth behind each company and what they can offer. Hosting my website with SiteGround has been a great experience so far on the face of it, so digging into some real statistics was always going to be interesting. I’ve been monitoring my site for well over a month now to ensure that the data I’m seeing is relevant and useful! I’m absolutely chuffed to report that my great experience with SiteGround continues! My site hasn’t encountered a single second of downtime over the past 24 hours, 7 days, or 30 days! I know that they have a 99.9% uptime guarantee, but to actually see it in action is pretty impressive. Next up was SiteGround’s competitor, BlueHost. Again, I signed up to BlueHost at the same time as SiteGround to host a replica website. I’ve been monitoring my website’s uptime over the same time frame to ensure accurate and comparable results. I was a little more wary of BlueHost because, although they’re a great host, they don’t promise their customers an uptime guarantee. Spot on! BlueHost gave me the same results as SiteGround did, with 100% uptime since my site has been live. Strangely, I actually feel slightly more positive about my BlueHost results because they weren’t guaranteeing anything in the first place. It’s nice to see that even though they don’t make promises, they’re still up there with the best! Response time is perhaps something that people pay less attention to, but it’s just as important as anything else! Response time represents the time it takes for the web server to respond to requests from your website. One of the reasons why people choose data centers nearer their largest pool of visitors is to ensure a quicker response time. As we know, the world has become increasingly impatient in 2018! Achieving a good user experience ties in with ensuring your website responds and loads within around 2-3 seconds. This is the kind of time we’re aiming for! Again, I used Uptime Robot to measure both web host’s response times to start with. 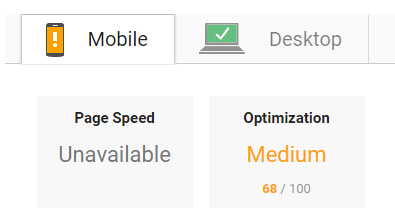 Before I begin, I feel it’s necessary to state that my SiteGround hosted website is completely unoptimised. I haven’t loaded or installed any plugins, and I’ve not enabled any caching apps at all. It’s a fresh install of WordPress’s twenty-seventeen theme so I wasn’t expecting an awful lot in terms of response time. Over the last 24 hours, my SiteGround website has an average response time of 855ms. It’s not a great time, but it’s not horrendous either, especially given the fact that nothing has been done to improve my site in the slightest. Although it powers websites worldwide, I was apprehensive about BlueHost’s response times due to them being based in Utah. I made sure before running any tests that my WordPress install via my BlueHost control panel was the same as my SiteGround site. I used the same theme and didn’t install any plugins. Would you look at that! A response time of 540ms! That’s 300ms faster than SiteGround over the last 24 hours! I don’t really have much more to say on the matter aside from being really pleased with BlueHost’s results. The way in which your website performs can undoubtedly effect the amount of visitors or customers you receive. If people have a poor user experience, your website doesn’t load fast enough, or the ‘behind the scenes’ isn’t set out correctly, you could be damaging your site’s reputation! Although I knew my site wasn’t going to be performing at it’s best as I hadn’t optimised it, I still wanted to check out it’s overall performance. I used a variety of tools to measure speed, performance, and load time. Did you know that page speed can have an impact on your SEO? Check out my 9 actionable SEO techniques for 2018 to find out more. Measuring website performance isn’t as simple as popping your URL into one report generator and hoping for the best. There are lots of different metrics to measure, so I spent some time researching the best tools to use. First up I checked out GTmetrix which gave me a PageSpeed Score and load time based on a test server region of Vancouver, Canada. This is notable because the data center I chose when signing up to SiteGround was the U.K. so I was intrigued as to how well it would perform. Surprisingly, my PageSpeed score came in at an ‘A’ (95%) with my website loading in 2.2 seconds across the globe! It’s fair to say I was pretty taken aback by these results as I really wasn’t expecting them! Thank you SiteGround! Next up I used Uptrends to monitor my website load time from a London location using a native speed connection on a desktop (this site is pretty cool as you can run tests from multiple locations and devices). Using the same location that my SiteGround hosted data center is in, my website loads in just 0.8 seconds! Way under the recommended 2-3 seconds – phew! Obviously I don’t have much data on my website as of yet, but what is there hasn’t been tampered with at all. 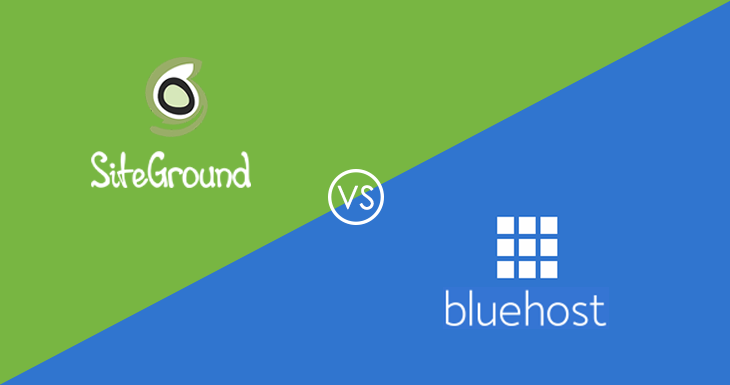 With SiteGround’s performance results being so good, I wondered if BlueHost could keep up with it’s challenger! As with all my tests, I used exactly the same tools and the same install of WordPress to ensure accuracy and consistency. 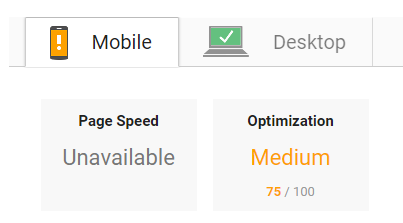 At first sight, it appears as though my BlueHost hosted website loads faster than my SiteGround website. However, I must take into consideration the test server region on these performance tests. The above GTmetrix test is performed in Vancouver, Canada, which is around 908 miles from BlueHost’s server location in Utah. Compare this to SiteGround’s location in London which is over 4700 miles away, the difference is explained! So, although my website loads in just 1.6 seconds, compared to SiteGround’s results which are much further away, it’s not as impressive as I was expecting. We’ve flipped over to the other side now by measuring my website’s performance using a London test server, with a Utah based data center. 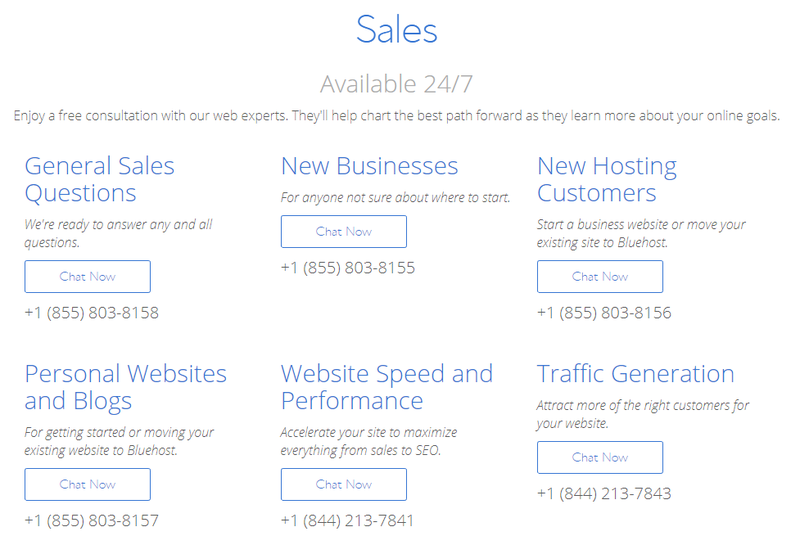 However, I’m still not feeling as wowed by BlueHost’s results as I am with SiteGround. My BlueHost website has fewer requests but still loads in almost 1 second slower compared to the other host. That’s not to say that the results aren’t great though! A slightly lower PageSpeed Insights score compared to SiteGround, my BlueHost website received the same recommendations. Google suggests eliminating render-blocking content, reducing server response time, and leveraging browser caching. In fairness, most of these issues can be resolved by optimising my website’s. Before we take a look at my personal experience with both hosts’ support, I thought it would be worth checking out their latest twitter mentions. 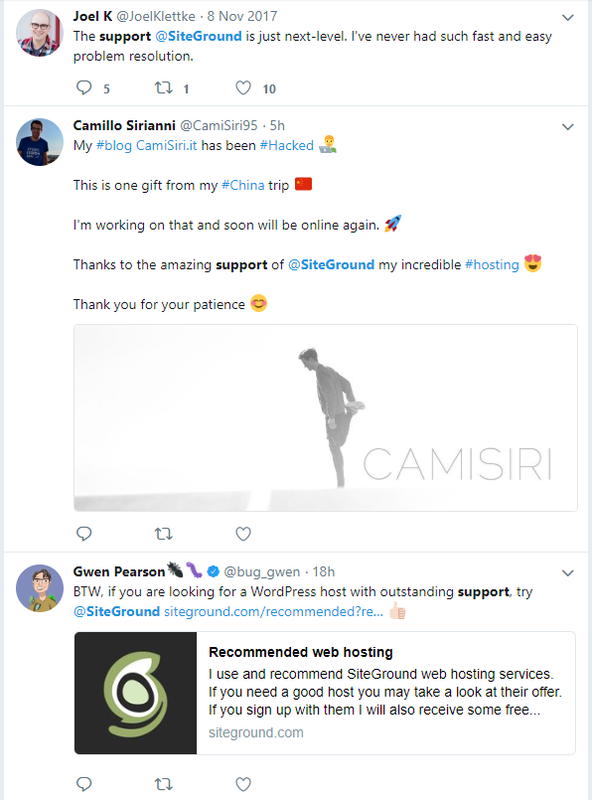 This gives us an indication of what others (not just me) think of SiteGround and BlueHost. The general consensus here seems to be pretty positive, don’t you think? 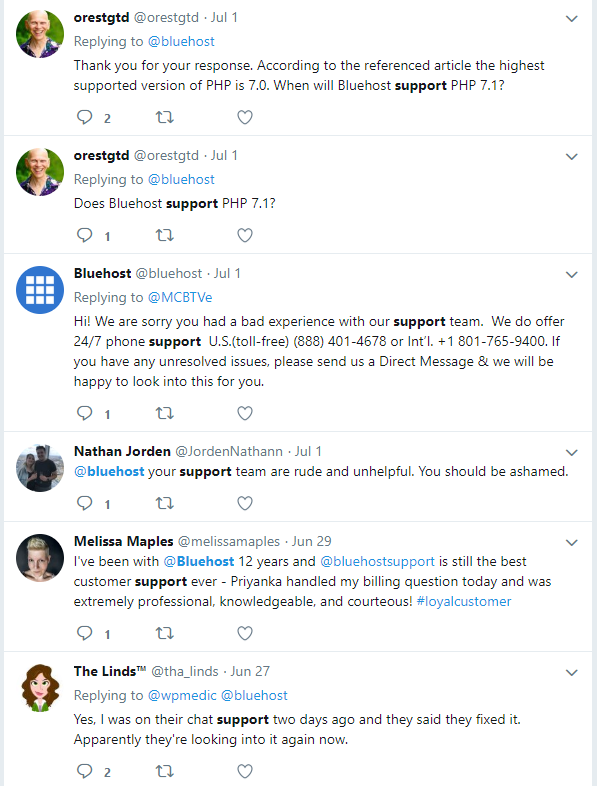 BlueHost’s twitter feedback seems to be a bit of a mixed bag. However, it seems as though if they do receive any negative feedback, or poor reviews, their staff are on hand ready to help and rectify the situation. For potential customers and existing users alike, SiteGround always strikes me as a customer focused company. First off, they display their response times to everyone allowing you to choose the best method of contact for your needs. I like that, I really like that! The best thing about this is that they actually stick to their word. Every time I have contacted SiteGround I’ve not been disappointed. I don’t regularly telephone them as it’s not my preferred choice of contact, but I have tested it out and their staff have been friendly, knowledgeable, and quick to answer. 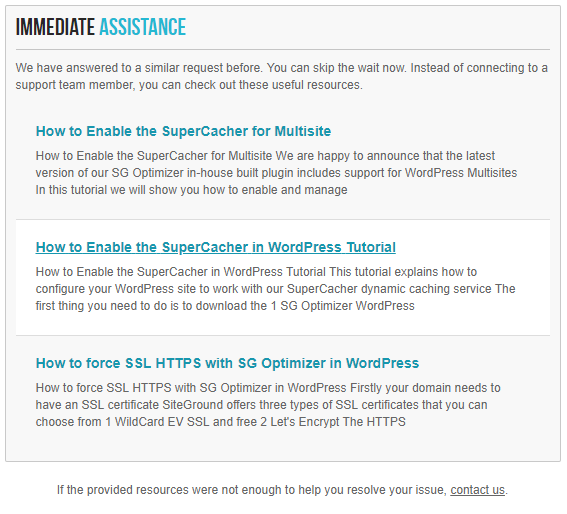 When you go through SiteGround’s support portal, they try and get you the best help in the shortest time. In my most recent test, I wanted to know more about how the SG Optimizer plugin worked, so I described my request. Immediate assistance options are provided with the option to chat to someone straight away should the assistance not be relevant (which it actually seemed to be)! For the purpose of this comparison, I wanted to see how their technical support team would answer my question. So here goes, you can see for yourself! What I love about SiteGround’s support is that they’re super friendly and that puts me in a good mood! The advisor, Ivaylo, suggested a helpful article to begin with, and then delved into my question, answering everything I needed to know. Although the chat duration took 13 minutes for a reasonably short question, it didn’t really phase me because of how dedicated Ivaylo appeared to be. The chat itself was initiated within less than 1 minute, and the outcome was really positive. 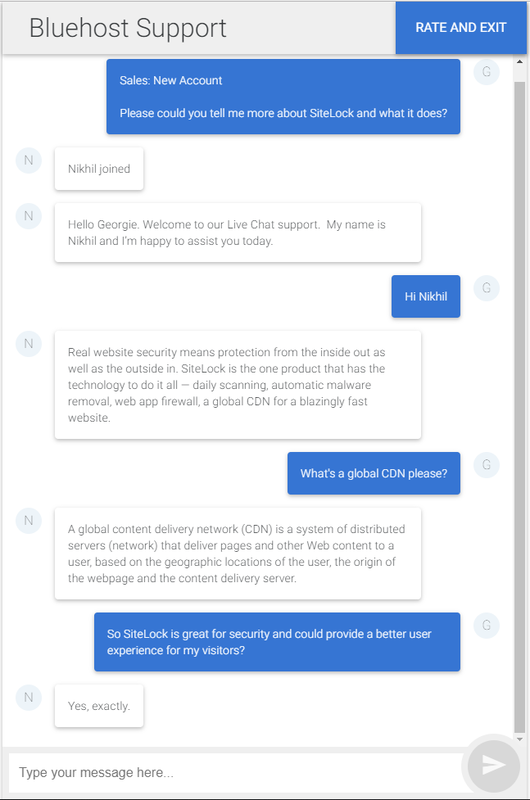 BlueHost keep their support fairly simple. They’re contactable via live chat for sales and existing customers, ticket support, and telephone (U.S. toll-free). Although their support is available 24/7 it did concern me a little as to whether they would be contactable at certain times in the U.K. I waited 12 minutes and decided to close the chat window and go via the sales live chat to see if I would get a quicker response. Thankfully I did! Who knows how long I would have been waiting otherwise. I was connected with the chat advisor, Nikhil, who was actually very helpful. He answered my question in a lot of technical detail, as well as clarifying further questions along the way. My experience in the end was a very positive one. I couldn’t have asked for a better response from Nikhil, and he responded to me very quickly. It’s just a shame that it took over 15 minutes to get to this point, navigating via multiple channels to be able to speak to someone. Before I start this section, I’d like to point out that you shouldn’t base your decision on pricing alone. In fact, you shouldn’t base it on any of these factors alone, that’s why I’m including pricing so that you can weigh up who the best host is for your needs, taking everything into account. For me, pricing is about what each host can offer for the amount you pay; value for money! SiteGround present tiered shared web hosting, allowing their users to pick a plan that suits their needs at any given time. Their prices start from £2.75 per month and go up to £7.95 per month. In my experience, this is an average price (not the cheapest, but not the most expensive). I would personally pay the extra £1.25 per month to have their premium features. The backup restores and SuperCacher alone are worth the difference in price! Every single one of SiteGround’s plans includes SSD storage, a choice of data centers, and server technology that’s beyond expectations. BlueHost come in slightly cheaper with their tiered plans starting from only £2.00 per month. That’s less than a sandwich! Their pricing is frustratingly only available in U.S. dollars, but that’s a very minor annoyance at this point. If you’re willing to dish out an extra £3 per month, you’ll have the choice between BlueHost’s Plus and Choice Plus plan (which are currently the same price). This will give you access to unlimited websites, website space, email accounts, and more. 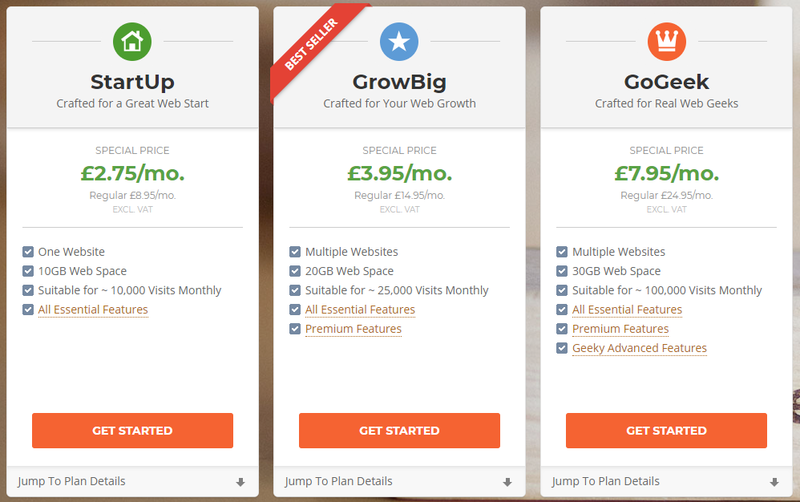 I’d recommend upgrading to one of these plans if you know your website is going to need a little more oomph in the future. Although they’re advertised in dollars, BlueHost also include $200 worth of marketing credits to help your website generate more traffic. This is a really welcomed added extra that not all hosts include, but it certainly entices me in! BlueHost also offer some interesting additional services. Take their website design for example; they will design, build, and market your website so that you can focus on your business! Yes, you’ll have to pay for these services, but the fact BlueHost offer them in the first place is pretty awesome to see. This is an example of how a web host has expanded their territory that little bit further in order to provide an all-in-one solution for your website needs. Hopefully by this point you’ll already have an idea of who you believe the best web host is (for your needs). I’ve compared both hosts for a reason; because I think they offer different qualities and features in their own right. If you were like me once and you’re starting a blog for the first time, or running a small website or business, I can’t recommend SiteGround highly enough. The features you get for the price you pay is pretty outstanding. On top of that, you’ll receive the best customer support I’ve ever received from any web host on the market. 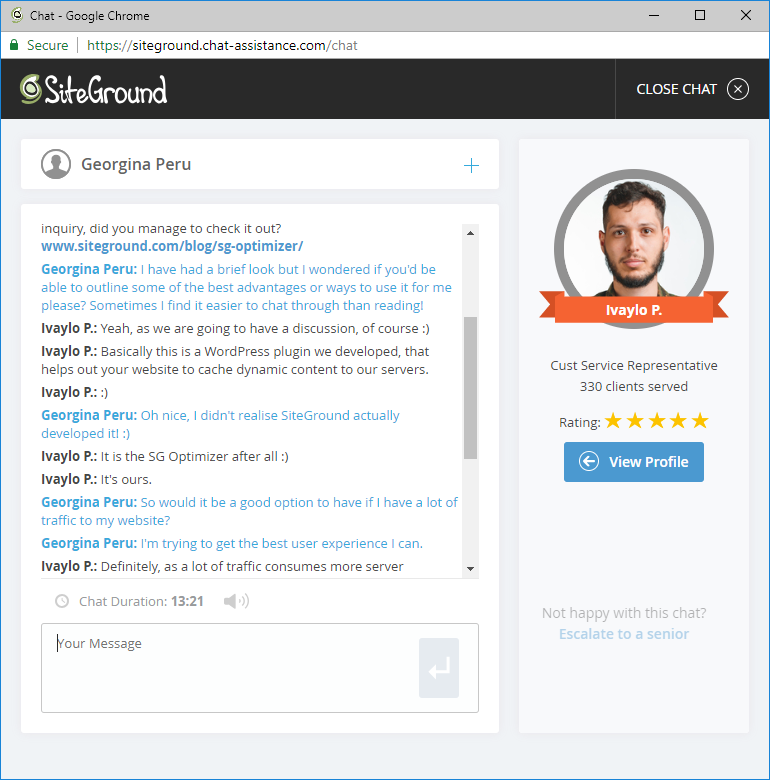 SiteGround are my number 1 choice for those who may need a little helping hand, or simply want to know that they can speak to someone if something goes wrong. 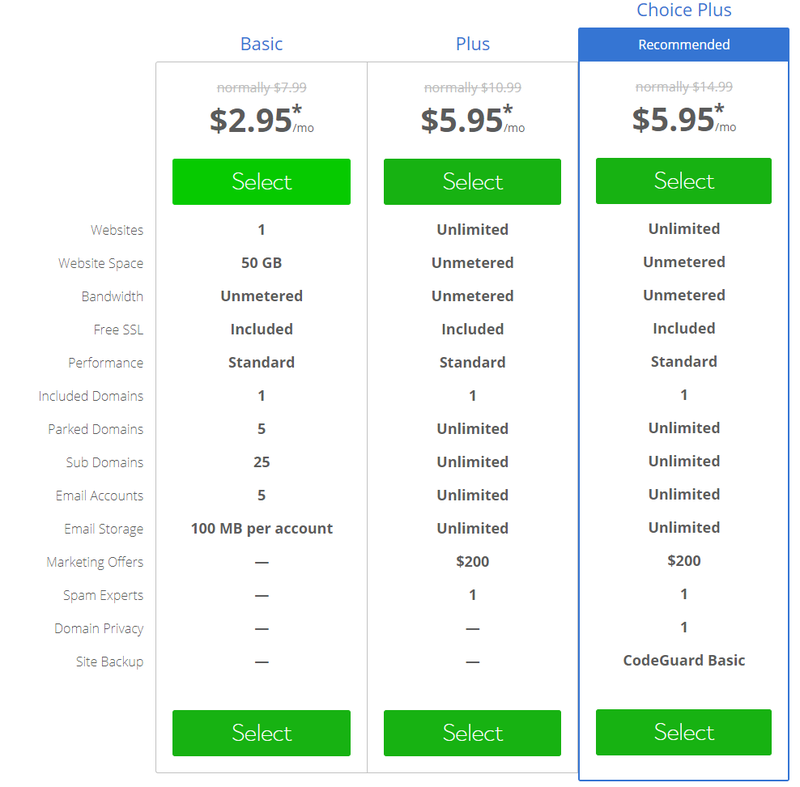 For those of you who know exactly what you want and aren’t interested in upgrading your plan when your website gets bigger, BlueHost is my recommendation. It would be silly to turn down their Choice Plus plan which is currently the same price as their Plus plan. You’ll be able to enter the world of eCommerce and marketing with ease, enjoying freebies and extras to help you along your way. Sure, they might not be able to help you straight away if you have a problem, but when you do get through to someone they are definitely experts in their field.